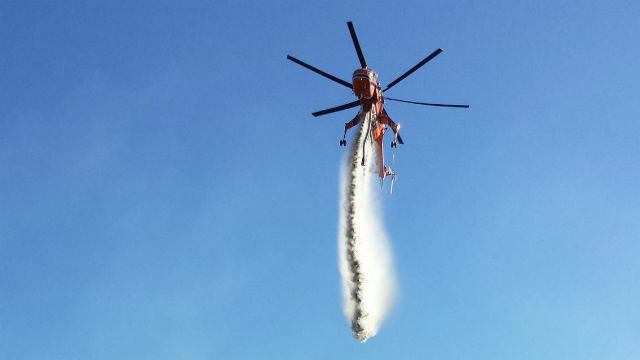 San Diego Gas & Electric announced Wednesday it is bringing back a giant Erickson Aircrane helitanker in case wildfires break out during peak Santa Ana winds on Thursday. Dave Geier, senior vice president of electric operations, said the aircraft would be operational by 4 p.m. Wednesday and remain in San Diego for two weeks. 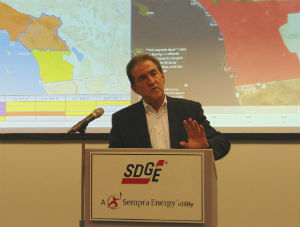 SDG&E is paying for its use during the period. The utility has leased the craft during the regular fire season for the past eight years, and it had already returned to an Erickson facility in Nevada. Geier said the decision was made Tuesday to bring it back. Forecasters at the National Weather Service office in San Diego are predicting “the strongest Santa Ana winds occurring late tonight through Thursday, resulting in an extreme fire weather threat and possible damage.” Gusts as high as 90 mph are expected in the San Diego-area mountains. Dave Geier briefed reporters at SDG&E’s emergency operations center. SDG&E activated it’s emergency operations center Monday, monitoring weather conditions and checking numerous remote cameras that can zoom in on developing fires. Geier said the utility was prepared to turn off power if high winds threaten to down power lines and spark fires. The utility cut off power to fewer than 100 customers in Descanso for about eight hours on Tuesday as a precaution. On Wednesday night, SDG&E cut power in several other East County communities, warning that the outages could last several days. In addition to bringing back the helitanker, SDG&E has engaged 12 private fire engines to accompany electric crews in the back country, and has stopped work on overhead wires. It is also stationing an emergency generator in Julian in case power lines there are damaged. Geier said the utility is closely coordinating its efforts with Cal Fire and San Diego Fire-Rescue. While major fires are burning in Los Angeles, San Bernardino and Ventura counties, San Diego has seen only a few small blazes during this fire weather period.